As discussed in Tuesday’s blog, 50% of children with autism spectrum disorder wander. Today, I encourage you as parents and caregivers to be prepared and establish a plan should this occur with your child. As a parent, you can never be overly prepared. Of course, much depends on your child’s age and functioning. Here are 7 tips to guide you in developing your plan. Almost all of them I have used with my son and recommend that you investigate them as you establish your plan. 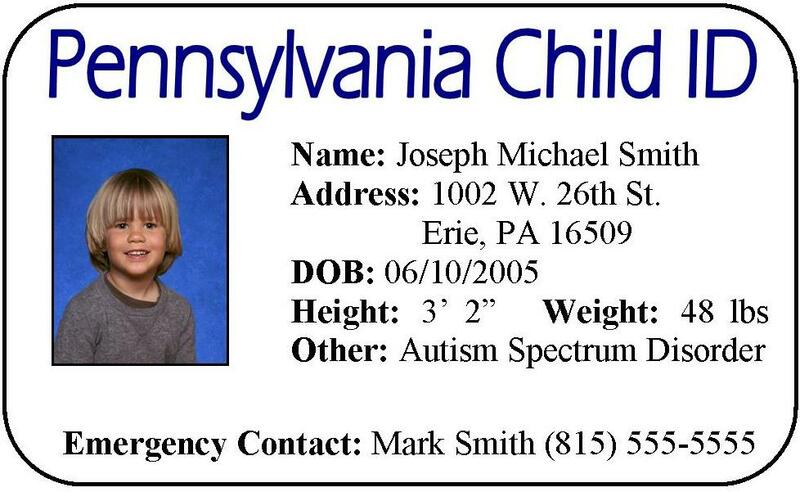 Parents/caregivers should always carry an identification card with your child’s picture, height, weight and any identifying characteristics. This is extremely useful should a crisis occur, and you need to show someone quickly. Children should have some form of identification listing their name, address, telephone number, emergency contact and medical information. You could also include your child’s diagnosis. If you’re searching longer than 5 minutes, call 911. It’s okay to call. You can always call back and tell them you’ve found your child. Some 911 centers maintain a special needs directory. This is a data base with essential information regarding children and adults with special needs. First responders can then be better prepared to deal with any challenges the situation might present. Contact your local 911 center to investigate. Affordable door alarms can be found at your local hardware store. Realistically, you cannot always be in the same room as your child. This alarm gives you a sense of comfort knowing when a door opens or closes. Talk to your neighbors. Let them know that if they ever see your child wandering without you to please try to stop the child in a friendly way and contact you immediately. Provide your neighbors with your child’s name, your name and home, cell or work phone numbers. Drowning is the #1 cause of premature death in children with ASD. Whether you live near a lake or not, teach your child to swim early. It could absolutely save their life. These can be worn on the wrist, ankle or clothing and are available commercially. I’ve not used these particular devices, but encourage you to learn more about them and share your thoughts or stories. When walking through the mall I tell Ryan to never be farther than an arm’s length away from me. When he was a preschooler, we talked about and practiced this at home. I would remind him of the rule before we arrived at the mall and prompted him while there. When we left I reinforced his behavior by saying “Good job staying with me.” I still use this technique. I often told Ryan that if he ever lost me, he should look for a policeman and say that he’s lost. Then Ryan could show the police the ID card that he carries. I encourage you try this with your child, of course as stated above, everything depends on the child’s age and level of functioning. From my own experience as a mother, wandering does happen and having a plan gives me a sense of security. I hope these tips encourage you to create a plan that works for you and to share the plan with your friends and family. Please share your tips with me too! I’d love to hear what works for you! This entry was posted in Uncategorized and tagged asd, autism, id cards, parenting, tips, wandering. Bookmark the permalink.